With great power, comes great responsibility. When you decide it is time to obtain your conceal carry permit, you have empowered yourself to carry a weapon of deadly force. Along with this weapon comes a long list of things you will be solely responsible for. I tell people that are just carrying for the 1st time that your CCW needs to become a lifestyle for you. It is not a toy, nor a magic stick that will ward off evil attackers without you having to use it. So, moving forward I am going to go over a few tips for the 1st time conceal carry folks as well as a quick brush up for seasoned CCW veterans. Keep it Concealed- When you pick out your clothes that morning, you will have to decide on how and where you will carry your weapon and how to conceal it. If every time you bend over to tie your shoe or pick up some trash, your weapon is exposed, you have failed at concealing your weapon. Try and pick out clothes that will afford you normal movements and still keep your CCW hidden from sight. Know the Law- It is YOUR responsibility to know the laws concerning where you can carry. Places such as courthouses, post offices, schools and polling stations are places that you can’t carry anywhere in the USA. However, places that sell alcohol and have a bar are much more gray and you may or may not be able to carry there. 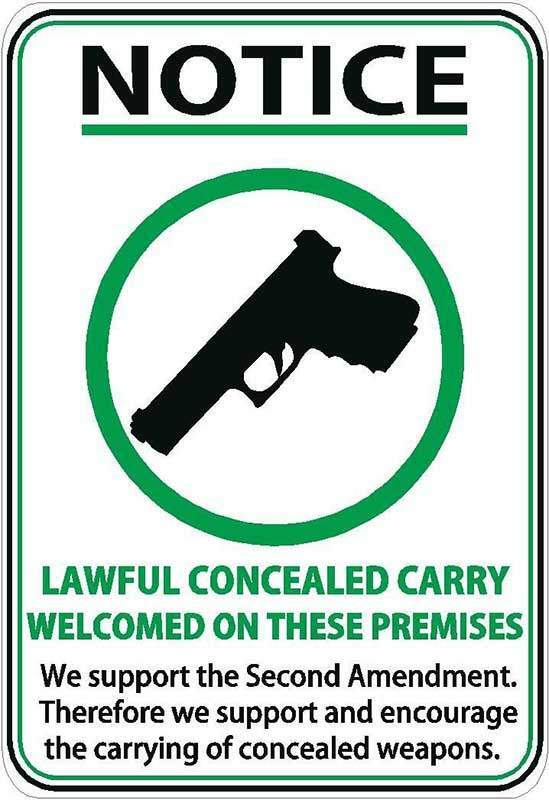 Look for the legally binding signs showing the 30.06 or 30.07 laws. Keep your permit with you at all times- You always need to have your permit with you EVERY TIME you have your CCW. Just because you can carry in your state, doesn’t mean you can carry in the states that border you. Understand that YOU are taking the responsibility and the liability of carrying every time you walk out the door. Don’t Brandish- If you are in a situation when deadly force is justified, it is no time to brandish your weapon in an attempt to ward off your attacker. You should be able to line up your sights on the attacker’s body and squeeze the trigger until the threat is neutralized. If you can’t do that, then you need to reevaluate why you carry. Don’t pull a gun that you aren’t willing to use. You are not a COP- Just because you have your conceal carry permit, doesn’t give you any more arrest authority than an unarmed citizen. If you see a crime in progress, know your tactical limitations. If you are carrying a Ruger LCP and 2 bank robbers each have an AR-15, it is highly unlikely you will win that gun fight and could possibly make it worse. I am not saying not to use your CCW when the situation justifies its’ use. I am saying know what you and your CCW are capable of and know your limitations. Comforting not Comfortable- In my opinion your CCW is there to comfort you that you can protect your life as well as your loved ones. It is not meant to be like a scarf that will accent your wardrobe. There are times when my CCW is not as comfortable as others, but I know it is there and have trained myself to ignore some occasional discomfort. Ok, we have gone over a few tips to get your mind right and prepare yourself with your CCW. In my next practical tactical blog I will go over tips on range training and carry positions.